﻿Lailat al Miraj Day: Calendar, History, Tweets, Facts, Quotes & Activities. 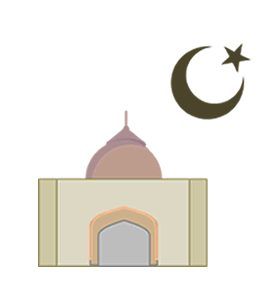 Lailatul Miraj (Arabic: الإسراء والمعراج) commemorates Prophet Muhammad's ascension to heaven. Muslims believe that on this night, an angel came to the Prophet, washed his abdomen with Zamzam water, and filled his heart with wisdom and belief. Then, Muhammad was called by God from Mecca to Jerusalem, where he prayed at the Masjid Al-Aqsa (Jerusalem). From Jerusalem, he ascended to heaven, where he was honored by being allowed to see God directly, visiting the highest levels of heaven, and leading all the past Prophets in prayer, including Joseph, Adam, Abraham, Moses, Aaron, Jesus, and John the Baptist. To get to his destinations, he rode Al-Buraq, a heavenly animal that was smaller than a mule but bigger than a donkey. He was given the gift of prayer by God. When he returned to Mecca, he accurately described a caravan that was headed to Mecca from Jerusalem to show the Quraish that had actually been there. Although the exact date of Laulatul Miraj is unknown, most believe it fell on 27 Rajab. My Chindin friend singgah Kota Bahru on her way to a resort island nearby. She was w her white BF. She wore shorts n tank top (appropriate holiday wear). A mob of around 10 makcik pakcik scolded her in public, call her tak tahu malu. She is not even Muslim. That’s Kelantan. Muslims believe that there are several levels in heaven. Muhammad was taken to each one by Angel Gabriel. At each heaven, a gate-keeper asked both the angel and Muhammad to identify themselves before proceeding. Muslims believe that Muhammad saw "Al-Bait-al-Mamur" (God's house). Gabriel told Muhammad that every day since the beginning of creation, 70,000 different angels pray there daily. Muhammad is also believed to have seen "Sidrat al-Muntaha" (a tree) in the seventh heaven. Its leaves resembled elephant ears, its fruits resembled clay jugs, and from it originated four rivers. Two of them were hidden in heaven, while the other two were made apparent to man in the forms of the Nile and the Euphrates. On the night Prophet Muhammad was taken on a night journey two cups, one containing wine and the other milk, were presented to him at Jerusalem. He looked at it and took the cup of milk. Gabriel said, 'Praise be to Allah Who guided you to the right path; if you had taken the cup of wine, your nation would have gone astray.' - Sahih al-Bukhari, Volume 7, Book 69, Number 482 This incidence is used to explain the fact that wine is forbidden to Muslims. Muslims are actually discouraged from celebrating or fasting on this day because of two reasons: First, the exact date is unknown. Second, there are no real rewards from God for celebrating this day. Read the award winning book, 'The Sealed Nectar'. It is Muhammad's biography and tells of the many events that happened on Muhammad's journey from Mecca to Lailatul Miraaj.